see the current results for yourself. ASDF-Status is growing up into a fine and upstanding citizen. ASDF-Status isn't a separate project at this point but if you have questions, comments or concerns, just drop Gary King a line. 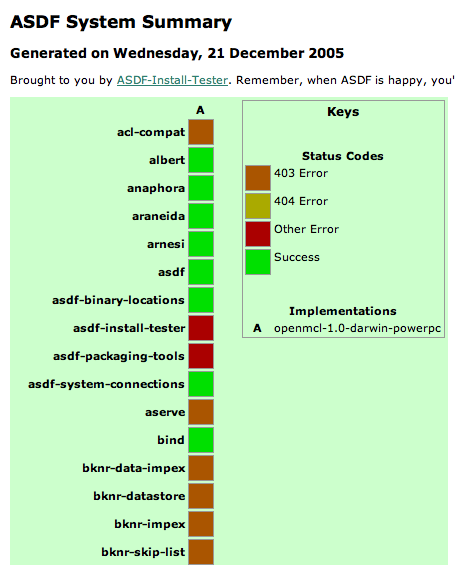 ASDF-Status is ASDF installable. Its CLiki home is right where you'd expect. Lots of fixes including HTML encoding (thanks to John Wiseman for pointing this out), improved SBCL support (thanks to Christophe Rhodes), better colors (thanks to Eric Hanchrow) and various other improvements.